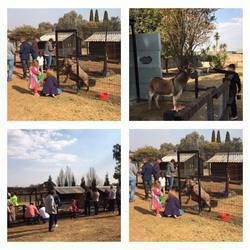 We boast an enclosed venue with a unique and superb outdoor adventure playground in Fairleads Benoni, that will have your little ones entertained for hours. Themed Party packages from R2900-00 are now available (including venue hire) - please email us for a full list of what we have to offer. Our onsite party shop is open to cater to all your party needs. We are able to quote you on themed decor, helium filled balloons from our balloon bar, party packs/boxes/buckets which can be made up to your requirements and budget. 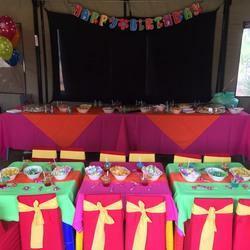 Full party packages are available to make your party an easy and stress free event. We also have a catering menu available. Please email us for more information. Just a quick note to say thank you for yet another awesome party at Kids ERA! Venessa is a pleasure to work with and went the extra mile to cater to my needs. Mary and Wilhemien were welcoming and ensured we had everything we needed. The kids had a ball and better value for money will be hard to find! Thanks again! Thank you to the Staff at Kids Era for their wonderful hospitality - my son had his 7th Birthday party there and it was the best party venue we have ever used. It was clean, well-equipped and the kids had the best time ever! What we loved about it was that we could sit, relax and watch the kids from one spot - we didn't have to run after the kids around a huge party farm. Thank you to the staff at Kids Era. My son's party was the best yet. The venue is fantastic with so many activities for kids at a reasonable rate. The staff were fantastic and helpful and the food was great too. Overall - best party venue I have come across. Thank you so much for the “out of this world venue”! Every single person that attended had a magic time. I was asked how did I find the venue etc, it is a venue that accommodates for everything and everyone’s. The place was clean, neat and spacious. I would recommend anyone who wants to put a huge smile on many faces to hire this venue and see for themselves. My son wants to have his party at KIDS ERA next year. You are thee most welcoming and accommodating host. 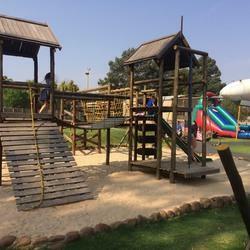 Kids Era provides a venue jam packed with facilities to entertain the children. They especially love the airplane and zip line! The venue is clean, well maintained and the staff are friendly, professional and accommodating. Venessa is the most obliging and attentive person to deal with and makes the party planning stress free as she really does have everything under control! I would highly recommend Kids Era! Thank you kids era for another amazing party! Such a great venue, the kids have the best time there! Would definitely recommend this party venue for all ages.